Mr. Cheney married his high school sweetheart, Lynne Ann Vincent, in 1964, and they have grown daughters, Elizabeth and Mary, three granddaughters and one grandson. 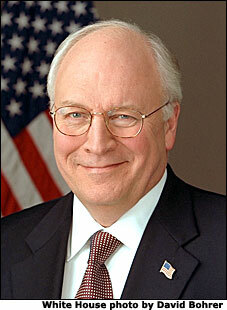 Vice President Cheney is realted to Harry S. Truman through their common ancestors, Robert and Margaret Tyler. William Holcombe Bolling was the son of Archibald Bolling and Anne E. Wigginton.1 William Holcombe Bolling married Sallie Spears White. Sallie Spears White married William Holcombe Bolling, son of Archibald Bolling and Anne E. Wigginton. Archibald Bolling was the son of Archibald Bolling and Catherine Payne.1 Archibald Bolling married Anne E. Wigginton. Anne E. Wigginton married Archibald Bolling, son of Archibald Bolling and Catherine Payne. Archibald Bolling was the son of John Bolling and Mary Jefferson.1 Archibald Bolling married Catherine Payne. Catherine Payne married Archibald Bolling, son of John Bolling and Mary Jefferson. John Bolling was the son of John Bolling Jr. and Elizabeth Blair.1 John Bolling married Mary Jefferson, daughter of Peter Jefferson and Jane Randolph. Mary Jefferson was born in 1741. She was the daughter of Peter Jefferson and Jane Randolph.2 Mary Jefferson married John Bolling, son of John Bolling Jr. and Elizabeth Blair. Mary Jefferson died in 1811. Martha Kennon was the daughter of Richard Kennon and Elizabeth Worsham.1 Martha Kennon married Robert Munford circa 1701. Elizabeth Worsham married Richard Kennon. John Bolling married Mary Kennon, daughter of Richard Kennon and Elizabeth Worsham. Mary Kennon was the daughter of Richard Kennon and Elizabeth Worsham.1 Mary Kennon married John Bolling. John Caldwell was the son of John Caldwell and Mary Church.1 John Caldwell married Margaret Collyer. Margaret Collyer married John Caldwell, son of John Caldwell and Mary Church. John Caldwell was the son of John Caldwell and Hannah Stillman.1 John Caldwell married Mary Church. Mary Church married John Caldwell, son of John Caldwell and Hannah Stillman. John Caldwell married Hannah Stillman, daughter of George Stillman and Rebecca Smith. [S676] Gary Boyd Roberts, Presidents 2009 Edition, page 178.